Ferdinand Maria, Elector of Bavaria (31 October 1636 – 26 May 1679) was a Wittelsbach ruler of Bavaria and an elector (Kurfürst) of the Holy Roman Empire from 1651 to 1679. He was born in Munich. He was the eldest son of Maximilian I, Elector of Bavaria - whom he succeeded, and his second wife Maria Anna of Austria, daughter of the emperor Ferdinand II, Holy Roman Emperor. Born during the reign of his father, he was known as the Electoral Prince from birth. Through his mother, he was a first cousin of Queen Mariana of Spain as well as the Leopold I, Holy Roman Emperor. On 8 December 1650 he married Henriette Adelaide of Savoy, daughter of Victor Amadeus I of Savoy and Christine Marie of France. The couple had seven children, two of which would have progeny. Still a minor he succeeded his father in 1651, his mother and his uncle Albert VI of Bavaria served as regents of Bavaria for three years. Ferdinand Maria was crowned on 31 October 1654. His absolutistic style of leadership became a benchmark for the rest of Germany. 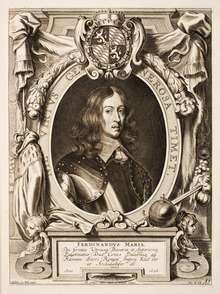 Though Ferdinand Maria allied with France he abstained the imperial crown in 1657 after the death of his uncle Ferdinand III, Holy Roman Emperor to avoid a conflict with the House of Habsburg. 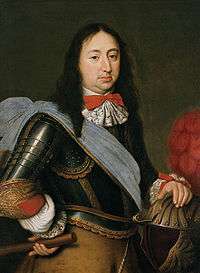 Ferdinand Maria supported the wars of the Habsburg against the Ottoman Empire with Bavarian auxiliary forces (1662–1664). During the Franco-Dutch War since 1672 Bavaria was officially neutral. The marriage of his eldest daughter Maria Anna Victoria and her cousin le Grand Dauphin in 1680 was the outcome of the Bavarian alliance with France. Ferdinand Maria modernized the Bavarian army and introduced the first Bavarian local government code. The elector did much indeed to repair the wounds caused by the Thirty Years' War, encouraging agriculture and industries, and building or restoring numerous churches and monasteries. In 1669, moreover, he again called a meeting of the diet, which had been suspended since 1612. The electorate he left with a very wealthy treasury. He died in Schleissheim Palace and was succeeded by his son Maximilian II Emanuel. He is buried in the crypt of the Theatiner Church in Munich. Ferdinand Maria married in 1650 princess Henriette Adelaide of Savoy and with her the Italian Baroque was introduced in Bavaria. The Theatiner Church in Munich was built from 1663 onwards as a gesture of thanks for the birth of the long-awaited heir to the Bavarian crown, Prince Max Emanuel. In 1664, he commissioned the building of Nymphenburg Palace, near Munich. Lake Starnberg became the venue of numerous festivities of the court with the famous fleet of Venetian Gondolas. On the shore Berg Castle was constructed. For the Munich Residence Ferdinand Maria ordered to erect the Papal Rooms. He was the great grandfather of French monarch Louis XV. Maria Anna Victoria of Bavaria (28 November 1660 – 20 April 1690) married Louis, Dauphin of France, and had issue. Maximilian II Emanuel, Elector of Bavaria (11 July 1662 – 26 February 1726); married Maria Antonia of Austria and had issue; married Theresa Kunegunda Sobieska and had issue. Luise Margarete Antonie of Bavaria (18 September 1663 – 10 November 1665) died in infancy. Ludwig Amadeus Victor of Bavaria (6 April 1665 – 11 December 1665) died in infancy. Stillborn son (4 August 1666). Kajetan Maria Franz of Bavaria (2 May 1670 – 7 December 1670) died in infancy. Joseph Clemens of Bavaria (5 December 1671 – 12 November 1723) Elector and Archbishop of Cologne died unmarried. Violante Beatrix of Bavaria (3 April 1673 – 3 June 1731) married Ferdinando de' Medici, Grand Prince of Tuscany and died childless. In addition, the Electress suffered three miscarriages: in June 1661, March 1664 and 1674. ↑ Marek, Miroslav. "Complete Genealogy of the House of Wittelsbach". Genealogy.EU. Wikimedia Commons has media related to Ferdinand Maria, Elector of Bavaria.